When are you going to die? Ten years from now? Tomorrow? Today? Who knows? The point is, death will eventually come so carpe diem! Seize the day! Make the most of every moment. Makes you want to not sweat the small stuff because in the grand scheme of things, these inconveniences, and annoyances, and feelings of sadness, even joy, are transient. This too shall pass. Most of the stuff you fuss about wouldn’t really matter a year from now. So focus on what matters. Be happy where you are. Think of what you already have rather than those that you don’t. After all, this desire to want to have this and that will never be satisfied. Choose kindness and compassion. Be more understanding. Be patient. Walk a mile in someone else’s shoes. Everyone is fighting their own battle. Be at peace with the fact that life is imperfect and unfair. And there are circumstances beyond your control. Let go and dwell on what you can change, your sphere of influence. Choose your battles wisely. Here’s to a fruitful and awesome 2018! Read “Don’t Sweat the Small Stuff… and it’s all small stuff” by Richard Carlson for more simple ways to keep little things from taking over your life. Imagine a world where you rate people you meet on the street with five stars or less depending on your encounter. A world where a simple hashtag can judge evil people to death. A world where you can literally block people and won’t be bothered anymore as you no longer can hear nor see them. Sounds like Science fiction but Black Mirror, a British-American TV series tackling the dark side of technology, paints a picture of a grim world that is similar to real life. It is fascinating and scary at the same time. There’s a story about implants that can record everything a person sees, an individual recreated from his social media profile, a woman being hunted down with people just watching and taking a video on their mobile phones. The narrative, the acting, and the production, I would rate as impressive. And I like how it’s also some kind of a social commentary on how the black mirror, the very thing you’re reading this from, pervasive as it is in our lives can lead to dystopia. Guess what, it’s not a distant future we’re talking about. It is here. Watch a few episodes and you’ll agree with me. It made me wonder about people putting so much effort on their well-curated but fake social media profile. About online bashing; those easily condemning, putting judgement, and even cursing to death people they barely know. About our obsession over talents shows. About manipulating reality. About poetic justice. About the loss of privacy. We’re doomed! Black Mirror made sure of that. It’s entertaining, nonetheless. And it may help us re-evaluate how we use technology and maybe, somehow, change our destined future. My old phone died. I’m not really techy and I have no idea what model it is so let’s just call it a really old phone. I was tempted to buy the same model but everyone was saying it’s about time to buy a smartphone. So I did. I felt sad about it because I can no longer boast how not having a smartphone is perfectly fine. 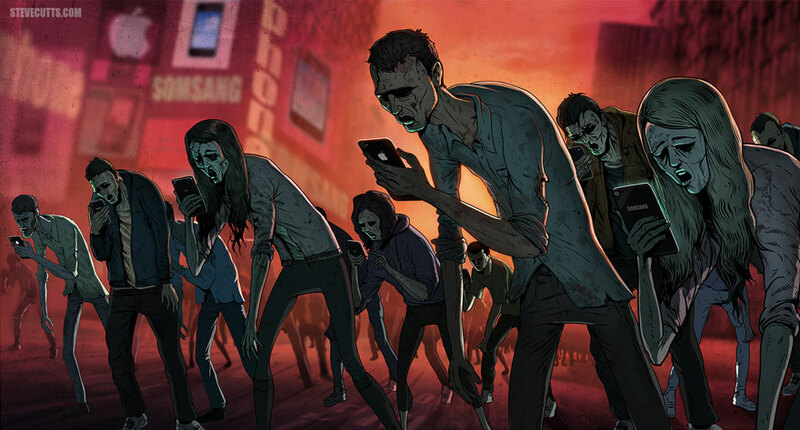 I’m now part of the zombie crowd (Thanks, Steve Cutts for the very accurate illustration). I have to admit though, with this new phone, I like how convenient it is to easily book a ride although I still pretty much prefer riding the taxi so I could support these taxi drivers, who are, to be fair, are not all evil. “Is there wifi?” That’s the question most people would be asking. The common question I got asked when I spent a week at Makiling, which is a lovely place by the way; but since we were up in the mountains, the signal was very weak, to the dismay of everyone. We’re so accustomed to being connected or online all the time. I still can’t understand how every moment, one has to constantly look at the hypnotic screen – while riding the jeepney, inside the elevator, in between conversations, heck, even in the toilet! “The things you own end up owning you,” said Tyler Durden of Fight Club. And it’s an apt statement to these phones controlling our lives. It facilitates communication, yes. But with that comes the ease of spread of fake news, more incidences of cyberbullying, and promotion of unrealistic self-image. Add to that the strain to human interactions. We sure have a way of corrupting technology. It’s inevitable, I suppose. Maybe it’s just me being sentimental of the good old days. Or simply me growing old. Eek! There’s the suicide bombing at Manchester after Ariana Grande’s concert. And then the Maute terrorist group attacks Marawi. And then double bombing occurs in Jakarta. And then another one in Kabul; and let’s not forget, this happened to Saint Petersburg, too. And then Duterte declares Martial Law in Mindanao. And then we have Mocha Uson’s symbolism hoopla. And then online trolls, fake news, and mindless social media postings continue on. And then Trump wants to pull out of the Paris Agreement. And then we learn that the Nickelodeon theme park in Coron is pushing through. And then a gunman wreaks havoc at Resorts World. It’s a crazy, crazy, crazy world. And yet we see a glimpse of hope and kindness, and beauty in humanity. From the One Love Manchester benefit concert that would aid victims and families affected by the Manchester bombing. From Muslims protecting Christians from the Maute terrorists. From noble groups and individuals quietly doing their part to attend to the needs of Marawi evacuees. From Indonesians defying terror with their, “we are not afraid” message. From truth seekers, those making their stand for what is right, and citizens who are not afraid to question the government. From 146 other countries which ratified the Paris Agreement. From environmentalists defending our oceans and the planet. From people who strive to be human.